It's not every day you can take your dog to a ball game. 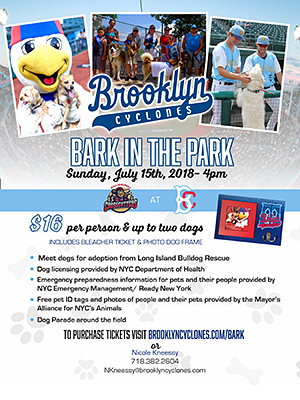 But each summer, the Brooklyn Cyclones invite fans to bring their dogs to their annual Bark in the Park baseball game at MCU Park in Coney Island. 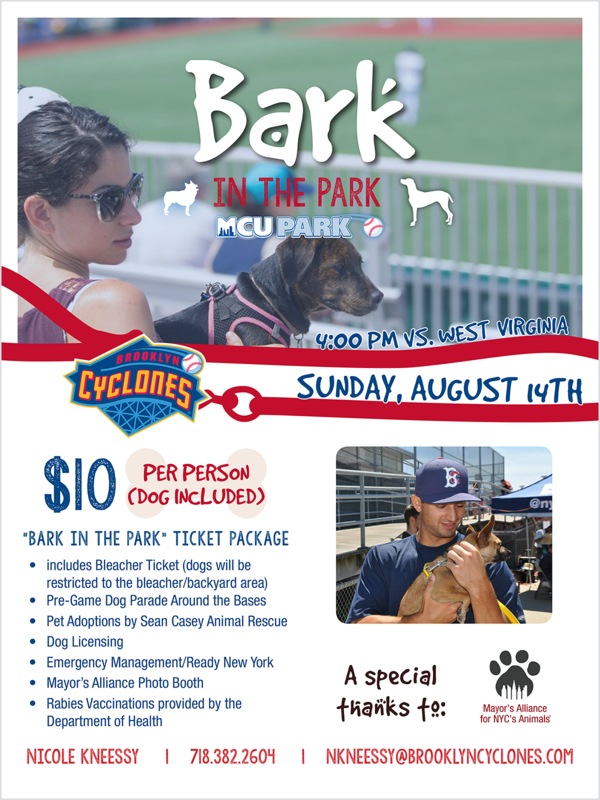 Cyclones fans and their canine friends have the opportunity for an exciting "dog's day" of fun as the Cyclones take on another area team. Bark in the Park features pet adoptions from an Alliance Participating Organization, a dog parade, and other fun family activities. Meet dogs available for adoption from Long Island Bulldog Rescue, an Alliance Participating Organization, 1:30–5:00 p.m.
Pet Safety & Emergency Preparedness! Learn emergency preparation tips for people with pets from representatives from New York City Emergency Management / Ready New York. 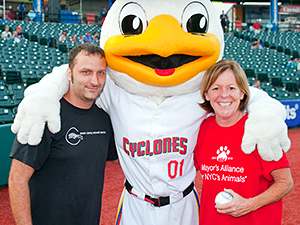 Receive a special edition Brooklyn Cyclones dog photo frame with your ticket purchase. Take part in a pre-game parade around the field with your dog. Have free photos taken with your dog by the Mayor's Alliance for NYC's Animals. Tickets are $16 and include one person and up to two dogs seated in the bleacher section, plus a special edition dog photo frame. Visit BrooklynCyclones.com/bark and use the code "BARK" to purchase tickets in advance. On the day of the game, you may purchase tickets at the Cyclones' box office. For more information, contact Nicole Kneessy at (718) 382-2604 or NKneessy@BrooklynCyclones.com.